Fairy gardens are really popular right, so my daughter wanted a fairy garden party for her birthday this year. The guests each made their own personal fairy garden. 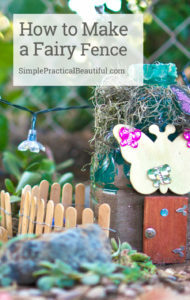 Our fairy garden party was less about fairies, and more about gardening and building. 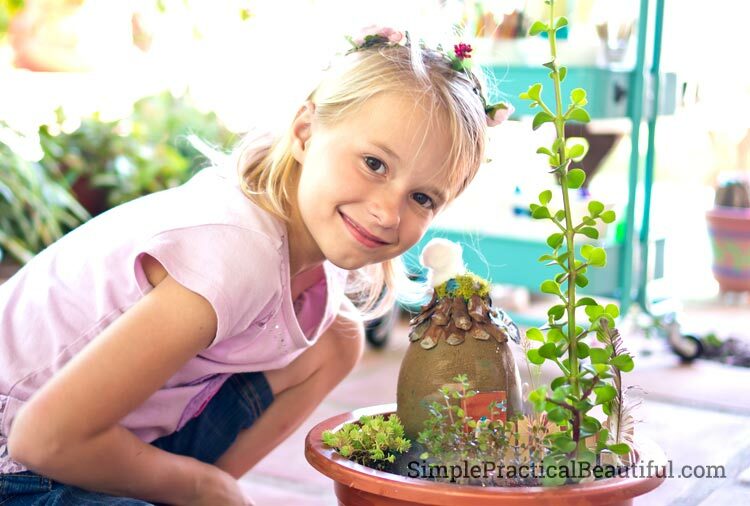 Most of the fairy garden birthday party ideas I found online were for little girls that wanted to be fairies. Since my daughters and their guests are ages 8 to 11 years-old, we needed something more age appropriate. Each guest spent almost the entire time at the party building a personal fairy garden. There was so much imagination and creativity flowing, it was amazing. 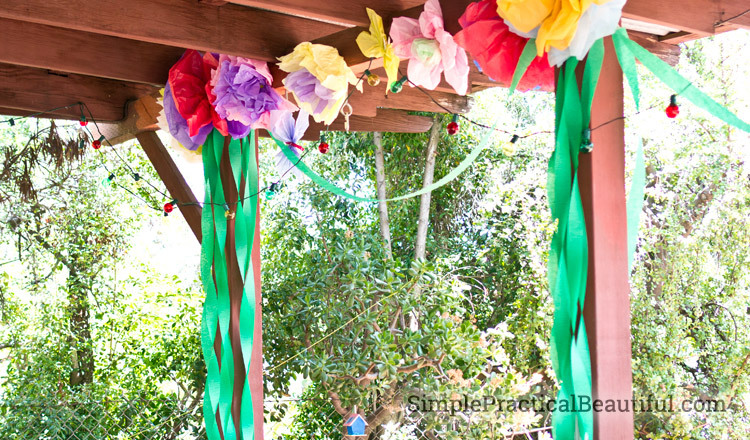 This would be a great party idea for teens and adults too. A fun invitation always starts the party off right. It may be a little more work upfront, but the guest come excited and ready to have fun. We found some miniature terra-cotta pots at Michaels, and we also bought a fake hydrangea flower and a bag of moss. We cut the small flowers of the hydrangea off the stem and stuck each in a pot with some salt dough (The Imagination Tree blog has an easy recipe for salt dough here). We covered up the salt dough with a little moss. 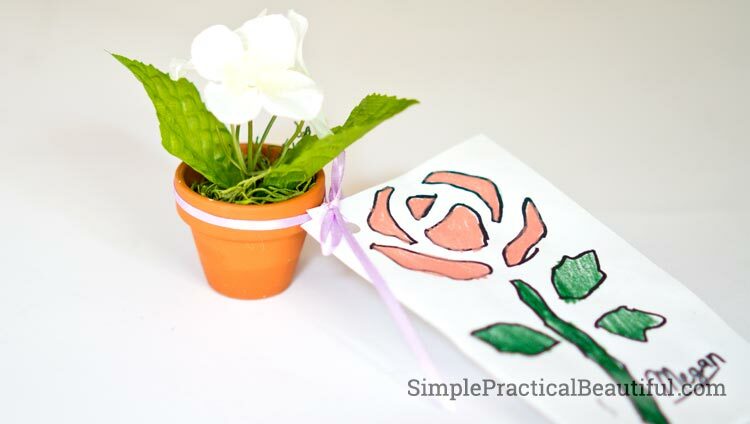 We attached a hand-drawn and hand-written invitation to each miniature flower-pot with a ribbon. My daughter created the invitations herself. When I take my kids to a party at a house I’ve never been to before, it helps if they have something to show where the party is, like balloons or a sign. It’s also a fun way to welcome guests. Usually, this just means putting a few of the party decorations outside the front door. 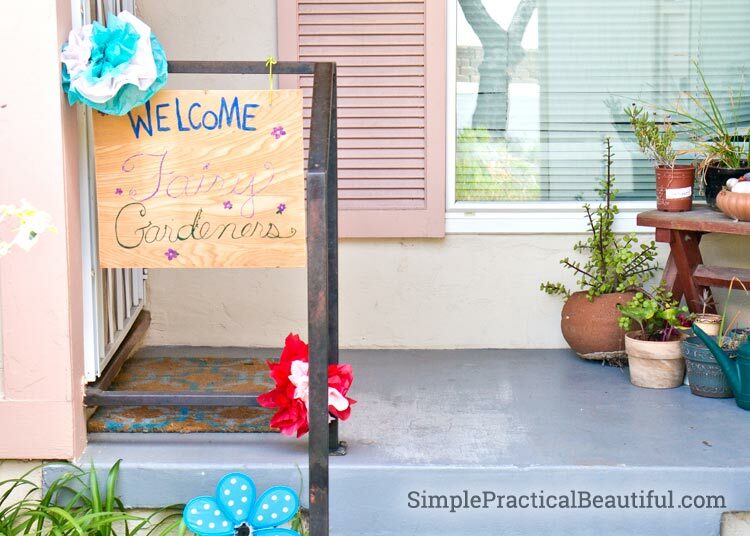 This time, I painted a small wooden sign to say, “Welcome fairy gardeners” on some scrap wood I had. A poster board sign would have worked just as well. 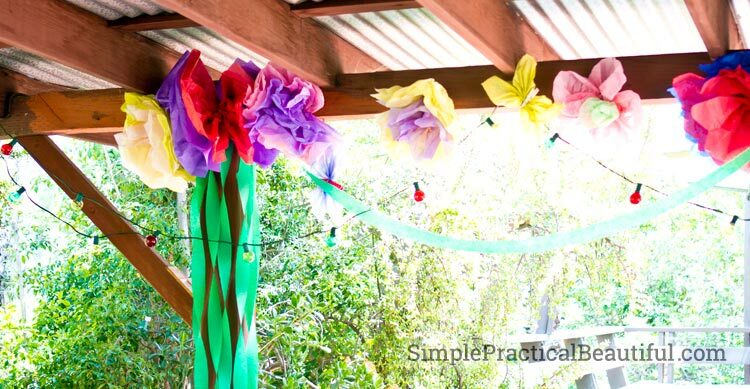 I also added a few tissue paper flowers from our party decorations. We made tons of tissue paper flowers. 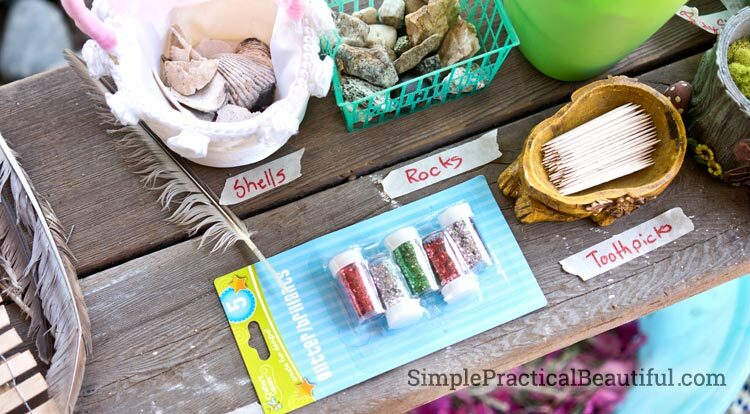 They are easy to make, cheap, and colorful (The blog Decor by the Seashore has a great post that shows how). They make great decorations. Plus, large flowers made it feel like we were small fairies in a large garden. And to add to that feeling, we used green streamers to make plants and stem. We also made a couple of tissue paper butterflies. 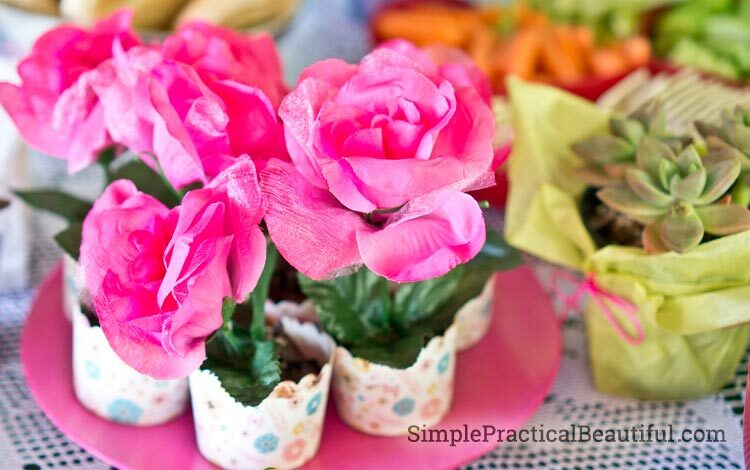 Once the party was finished, my girls want to reuse the tissue paper flowers as decorations in their room. 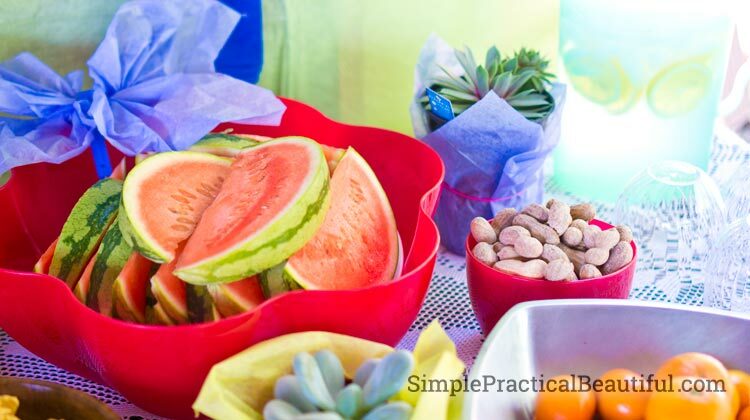 I usually try to avoid serving a meal at parties and just have lots of snacks for guests to graze on. For a fairy garden party, I tried to follow a theme of food that grows in a garden, mainly fruits and veggies. We also had a some peanuts and pistachios in shells, so that the kids could use the shells in their fairy gardens. My daughter made some dirt cups (chocolate pudding topped with Oreo crumbs and a gummy worm inside). We stuck a fake flower in each cup. The flowers were way too big for the cups, but I think that just made them more exciting to the kids. This was everyone’s favorite snack. 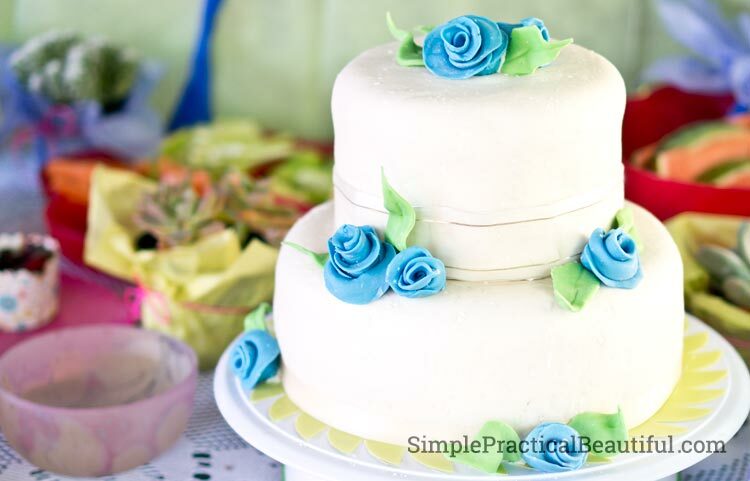 The birthday cake was just a simple white cake with roses. My daughter specifically asked for fondant on her cake because she loves fondant. Luckily, I’ve learned how to make marshmallow fondant, and it wasn’t too hard. I think any cake with flowers would be perfect for a fairy garden party. The hardest part of planning this party was figuring out what fairy garden supplies we would need and gathering those. 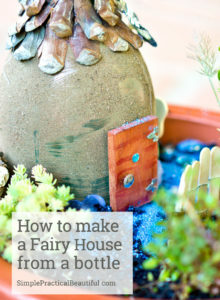 To help you out, I have created a whole list of what we used in my post about how to Create a Fairy Garden in Flower post, along with specific directions on how each guest can make a personal fairy garden. 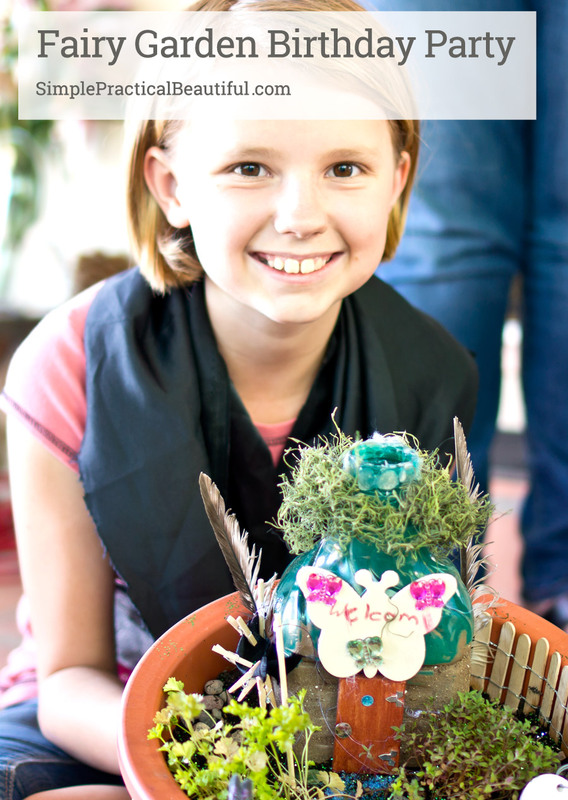 While gathering supplies for fairy gardens was a lot of work, actually hosting a fairy garden party was the easiest birthday party we’ve ever had. 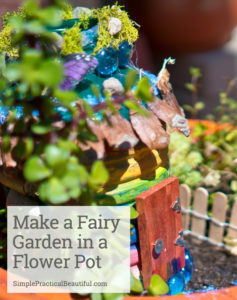 I just sat back and let the kids create their own fairy garden in a pot. 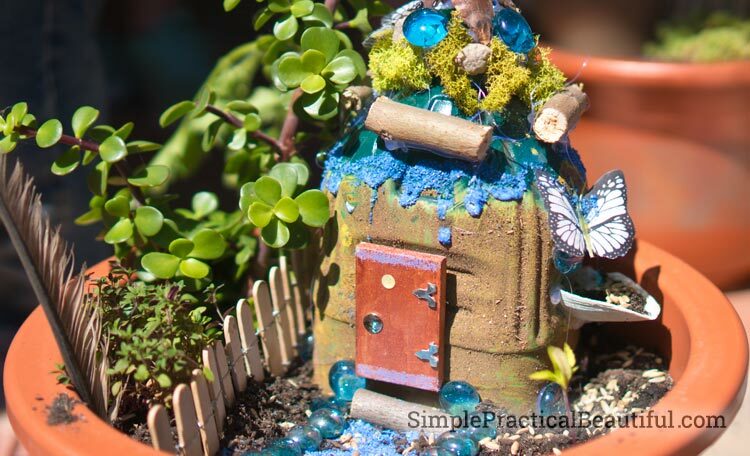 They spent more than three hours building and crafting beautiful fairy gardens. 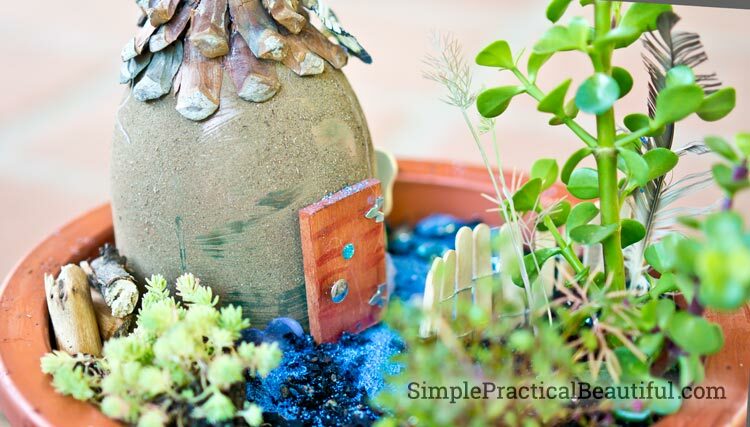 As a bonus, the finished fairy garden in a pot was the guests’ party favor. 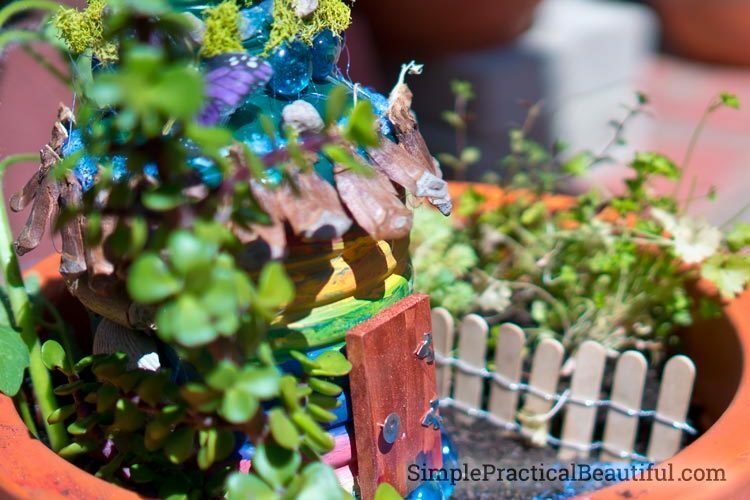 First, they painted then decorated their houses (you can read more about that in this post on making a fairy house from on old container). Then they added plants, mulch, and accessories. We built a Fairy Fence for each guest to use. Several of the kids finished off their garden with glitter. A few times it felt like the kids’ enthusiasm was slowing down, and I worried that I would need to think of something else to entertain them. But then someone would come up with a new idea for their garden, and everyone would be excited to try it out. Like adding a clothesline and using cotton balls to look like smoke coming out of the chimney. It was so much fun to watch my daughters and their friends share their creativity and build something they are proud of. Everyone had a great time. A couple of friends told my daughter that she needs to have a fairy garden party again next year. I’d say it was a success. 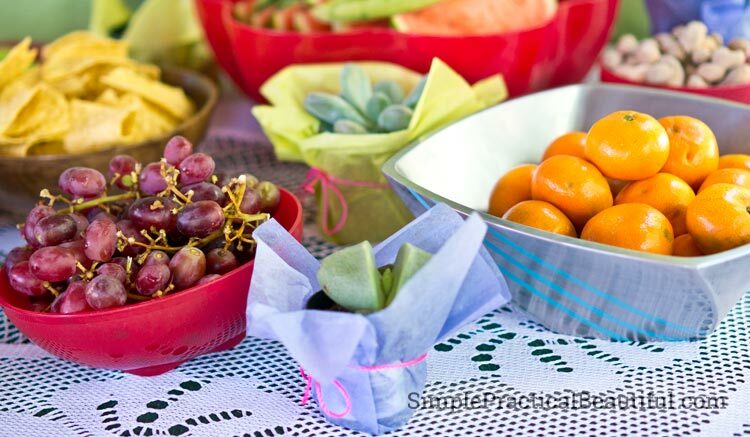 What an adorable idea for a party! So Sweet~Stopping by to let you know you are being featured on Friday’s P3 Party post! Have a great week! Thanks for pinning! Thank you so much! And thanks for hosting such a fun Pinterest party! it was so fun!!! maybe i should do it again next year!!! It was fun, but, no, we need to think of a new party idea for next year. 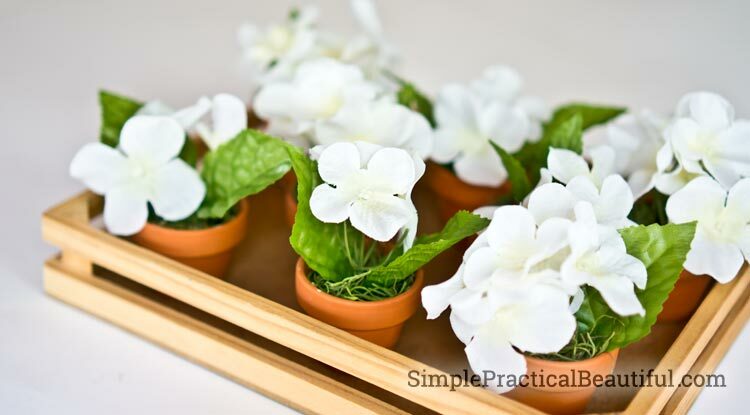 Something else that I can share on SimplePracticalBeautiful.com.